Are you tired of toiling with your child’s toothbrushing? Unfortunately, children don’t know the importance of good oral healthcare like we do, which can make brushing for your loved ones tougher than it should be. No need to worry! Your kid’s dentist in Hinsdale has some tips and tricks for parents on how to make brushing easier and even fun for your son or daughter. Instead of giving your child a generic toothbrush and toothpaste, let them pick their own out at the store. A Superman toothbrush for your son could be the difference maker for him to have fun while brushing. Or, maybe your daughter wants a pink Barbie brush? Either way, they will be more exciting about brushing with their favorite characters. Your loved ones can also pick out their flavor of toothpaste. There are many flavors on the market now, so let your son or daughter pick out which one they like best. Additionally, there are toothbrush kits that come with stickers where your children can actually customize their brushes for a more personal and enjoyable experience. 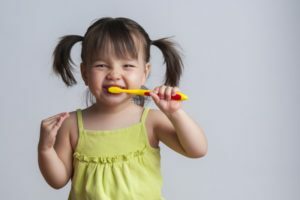 You can show them brushing is fun and that everybody does it by brushing your teeth with your kids. Your children model themselves after you, so it will help them get into a good oral healthcare routine and make brushing seem cool (because you’re doing it too)! Something else you can do to make brushing more amusing is to joke with them. You can make funny faces or use the brush as a microphone to entertain your children while brushing. This will give them something to look forward to as well as make the time go by faster while they brush! There’s a popular app out right now that plays two minutes of music (the recommended time for brushing). “Brush DJ” times your children’s brushing sessions and plays fun music to make it exciting for them. You can also have them clean your teeth. Let them brush your teeth like you used to do for them to make your son or daughter feel like a brushing expert (be sure to brush your own teeth after). If all else fails, you can offer rewards for good brushing habits. Use little prizes like getting to pick what book to read or give them a sticker after brushing. These rewards are harmless, but they will motivate your son or daughter to clean their teeth. Brushing doesn’t have to be a chore for you and your loved ones. Use your personality and creativity to make it something everyone can look forward to. Not only will this make your life easier, but it will set your kids up for successful oral health down the road. At Brush Pediatric Dentistry, we have 3 skilled pediatric dentists on staff. Dr. Mira Albert is a board-certified pediatric dentist that is specially trained in caring for your children. She loves teaching kids how to brush and floss properly to help them stay healthy for life. For any questions, she can be contacted by phone at (630) 504-2223 or on her website.